This photo makes me feel anxious. There’s just too much going on here: too many signs, too many overhead wires, too garish a light. 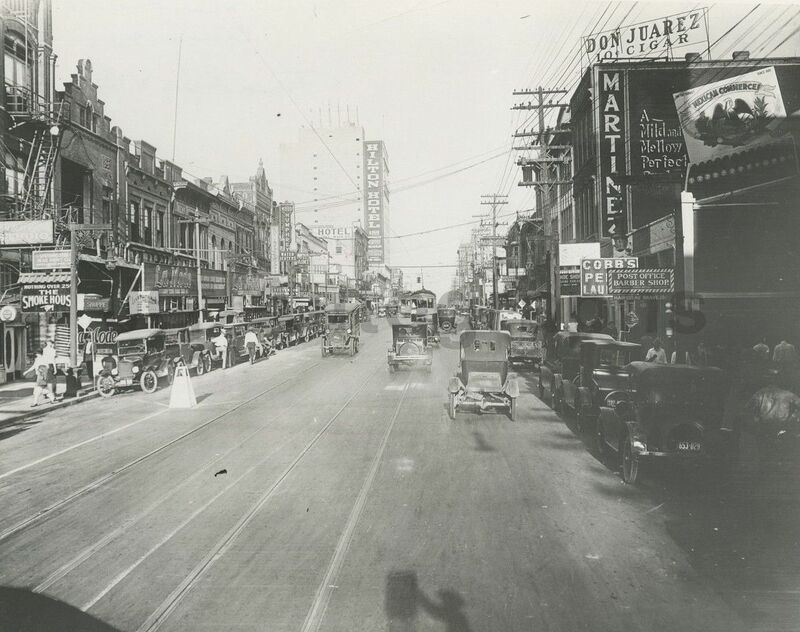 This is the 1800 block of Main Street, looking east. The photographer’s shadow can be seen at the bottom of the photo. A large hotel of some sort (the name of which escapes me at the moment) can be seen in the distance (in the 1900 block) at Harwood. 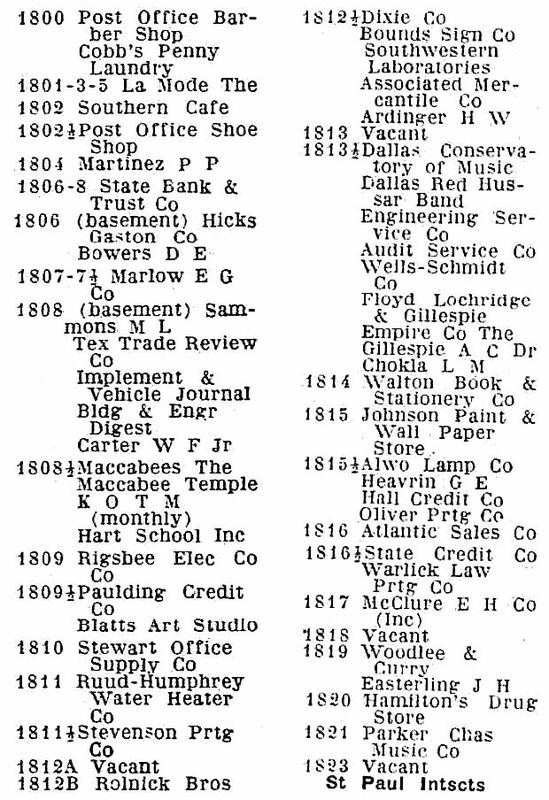 I have no 1926 directory to reference, but the 1927 directory has the building at 1811 Main(occupied in the photo by the Rund-Humphrey Water Heater Co. and the Stevenson Printing Co.) listed as being vacant. And the Hilton opened in 1925, so the photo seems to have been taken in 1925 or 1926. See the Hilton (the first one, not the later Statler-Hilton on Commerce) from a different angle in the post “The Hilton Hotel, Main & Harwood,” here. Most people shopped downtown though and either drove or took trolley or even took a bus. There weren’t the malls and even though there were family owned small stores in some of the neighborhoods, it was always special to go downtown to shop. Dallas was growing and growing and thousands came on the trains too just to spend a weekend or more. I wonder if this isn’t a frame from a motion picture of this busy scene. The silhouette is consistent with some early motion picture cameras, and the operator’s hand is properly placed to crank the film through. Maybe we’d better go looking for the rest of this little gem! is this a current ebay auction? No, it was from a few months back. It was up the week before Christmas. I broke down and asked an actual scholar about the camera shadow in the photo and was told it likely is a large format view camera on a tripod atop some elevated object like a truck or (shudder) a ladder. So likely there’s no motion picture footage to be run to earth. you’re correct. Frank Rogers a dallas commercial photograpger in the 1920s had a setup like you describe. i suspect he shot this image.